With the return of the Shearwaters increasing by the night you also tend to get a fair few researchers. This week has seen the arrival of Ben and Holy (of Countryfile fame) with their supervisor Tim Guildford (all from Oxford University) and Robin (Microsoft) who is very good at all the computer related activities. Here is a picture of one I found among lots of their luggage. This year they shall be continuing the very interesting and important research using geo-locators (little devices that can detect light levels - among other things - to work out and record the location migratory routes of these long distance migrants). This work will also be supplemented with other biometrics, mostly related to weight - that will be recorded throughout the season. Shearwaters are indicators of our marine environment and it is vital that this work continues in a ever changing world. I have been away for a few days on a Wildlife Trust of S. and W. Wales conference. This is a good opportunity for us to get together, particularly for those staff members in the more remote/inaccessible areas that we cover. It also gave me a chance to stock up cleaning supplies (and some beer supplies) ready for the coming season. As a result you will have to wait until after bird log this evening to find out what has been around on the island the last few days. Adopt a puffin - it's fun! 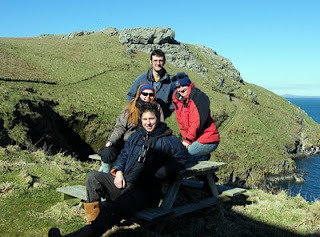 Long Term Volunteer Opportunities on Skomer, Register your interest now! In 2010 we shall be having two long term volunteer positions, one for May and June, the other for July and August. Both positions will involve spending some time on Skokholm Island. Applications for May and June should be in by 5 April, and for the second post applicants should register their interest by the end of April. The second post will involve work on an individual project. Please see full details of the positions before applying for either post. Lots and lots going on. Vol.s have been doing a sterling effort on the landing steps and some minor repairs made to hand rails. Meanwhile we have also managed to get a visit in to Skokholm, to check the condition of buildings and to make a future jobs list. Whilst there it would have been rude not to do a lap of the island. This was rewarded with a great view of a Peregrine chasing a Snipe (a Snipe which we had distrubed - the footpaths are so quite on Skok. at the moment that birds are a lot closer to the paths than normal). The snipe got away from the "fighter jet" speeds.....this time. Meanwhile the 16 Whitefronts that have been pottering around pembrokeshire were found sulking on Winter pond (Skokholm). Interesting things starting to move through today including a Black Redstart (Jerry, see below), goldcrest (Jerry) and chiff chaffs(chris). 16 Puffins in North Haven...........3 in South Haven. The return has started. Excitement among Wardens. But when will the puffins have the courage to start exploring burrows and re-establishing pair bonds? We have also welcomed our first volunteers for the season, ready and willing to help up get the island ship shape before 1st April. (first visitor boat for the season). Had some great views of the Short-Eared Owls re-establishing territories - one of the highlights of this time of year. This week has seen a complete change in the wind direction (now from the north) - leading to some rather sore lips due to the dry air. First spit of rain today! Now that Jo and Dave have left it has just been me and Jerry to fend for ourselves. A good week to plan our season ahead and really get to grips with how the place works. On a return voyage from the mainland yesterday (in rather rough seas) Jerry spotted a puffin among some razorbills. They have first been spotted on the Island for the last couple of year on the 19th and 16th March. So it does not surprise us that some are out at sea. We are therefore eager to see one on land. Cold Northerly winds are not the most tempting of conditions for the birdwatcher. Bird highlights since the last blog include an flyby of 16 White-fronted Geese, and some red-throated divers (although they were seen from the mainland but could have been seen from the Island if we were looking at the right time - not sure if that counts for the log?!). We shall keep you posted when the firsts for the season arrive. After a bracing walk to Moorey Mere and The Farm I decided it was about time to update the Blog, mainly because the chilly wind is blowing an Easterly force 4 or 5, so it is time to warm up a little. The island became inhabited again on the 1st March. With a full complement of two past wardens (Jo and Dave) and the two current wardens me and Jerry. The main aim of this first week is to have a big handover on how the island works and runs. Jo and Dave have been super and we both appreciate how much they know about the island and how much we have to learn. We have covered the monitoring programmes, plumbing, gas, solar hot water and the water supply. Along with cleaning the volunteers accommodation in preparation of first group on the 13th March. Our first voyage out to the Island on the 1st was in fact with BBC Wales News. We were taken out on the Sea Safari to do a mornings filming and this also gave us a chance to open up some buildings and check the tractors worked. On the trip over the weather was superb and the cliffs were full of Guillemots , Razorbills, Fulmar and Kittiwake. At this time of year the cliff nesting birds will only return to the cliffs in calm weather with the aim of re-establishing old territories or building new ones. So fantastic for your first day though. This was followed by a return trip to the mainland to pick up the Skomer boat and all our luggage. This generally went according to plan, with the exception of a slight hiccup with the tractor not starting whilst on the beach with an incoming tide. The water was already lapping at the tyres - with a quick battery change (still didn’t start), some head scratching, some hitting of several parts of the engine it started again, just as the water was about to cover the exhaust. Great way to start a new job if the tractor had not got going!! Sadly no pictures are available of this. Wildlife highlights include the wing tagged Hen Harrier, another untagged Hen Harrier, Red Kite being harassed by several buzzards (or was it the other way round, we are not sure), groups of up to 7 buzzards soaring on a thermal (most likely birds from different adjoining territories just reminding each other of their presence), Short Eared Owls starting to pair up, Little Owl sitting on the walls, 2 pairs of Shovelar on North Pond, 126 roosting oystercatchers at South Stream. Small groups of Redwings. A singing Reed Bunting and singing Meadow Pipits. Stonechat. Among others. First Wheatear of the season was seen by Jerry yesterday. We now eagerly await the first Puffins – watch this space!